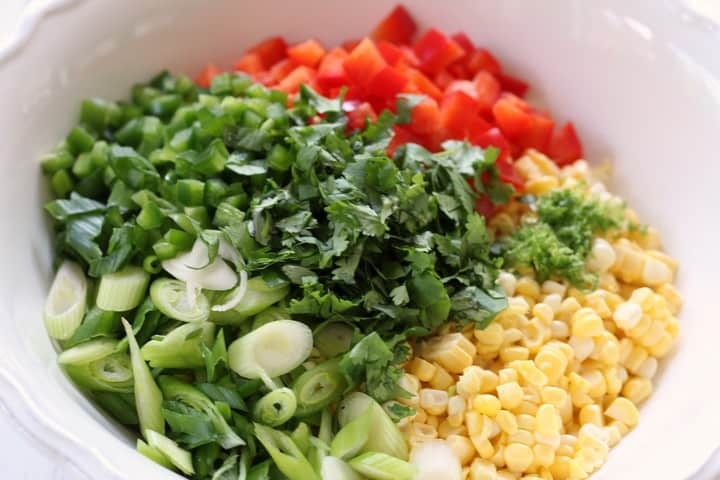 Home » Salads » Sweet Corn Salad -unbelievably sweet and tasty! Hi! My name is Sonia and simple and easy is my mantra! 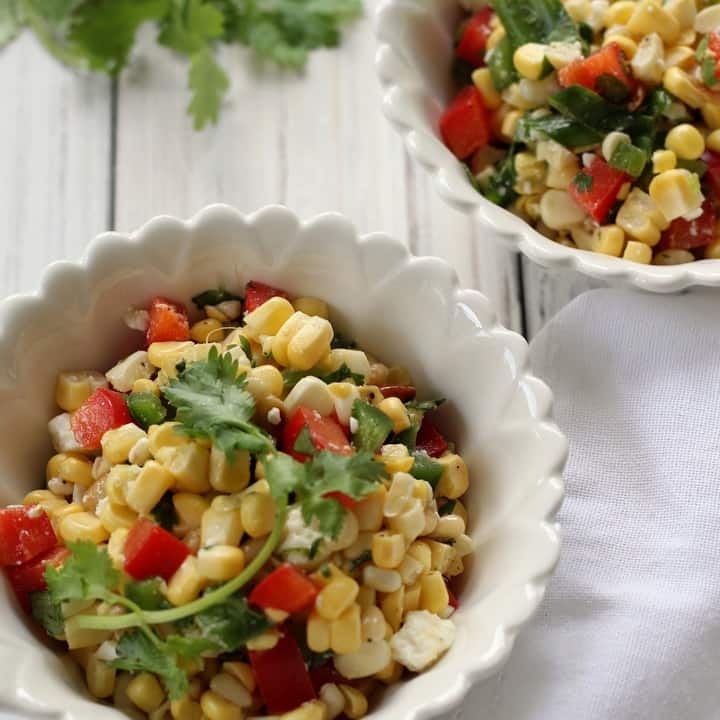 Looking for a crisp and tasty sweet corn salad to serve at your next BBQ with friends or to be enjoyed alone while sitting alfresco? 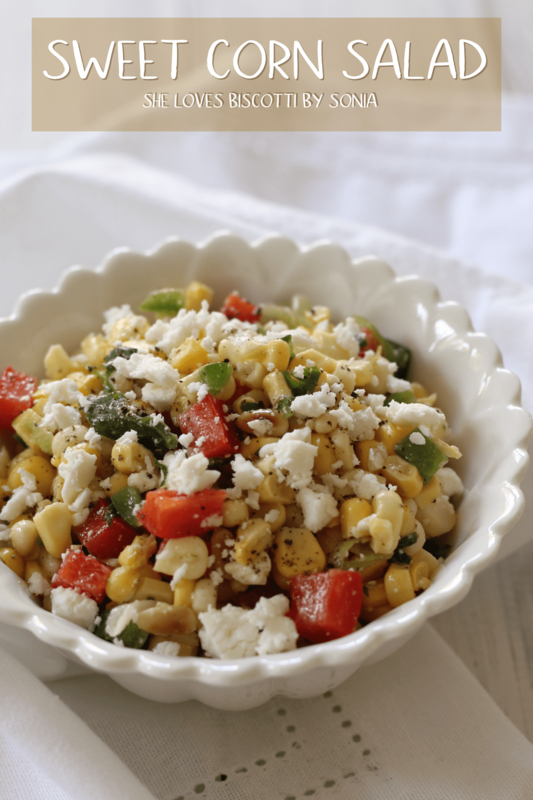 Then read along because this easy sweet corn salad recipe is for you. It doesn’t take long for this flavorful salad to come together. And best of all, there is no boiling, blanching or grilling required. I am dedicating this recipe to my dear mother Adele and yes Ma, I am keeping it raw! Let’s take a closer look at this variety of corn, before I show you how easy this recipe comes together. Sweet corn is one of six corn varieties. Unlike other corn varieties that are harvested when the kernels are dry and mature, sweet corn is harvested when immature, during the milk stage. For this reason, sweet corn has a high sugar content which lends that delicious sweet taste that we all look forward to when corn season rolls around. 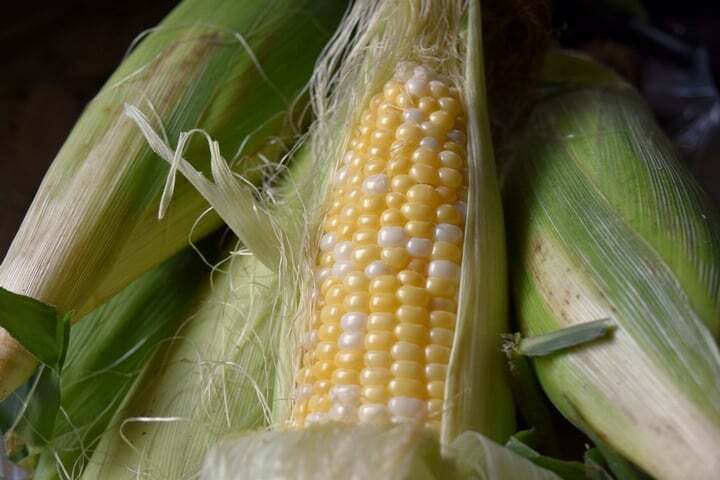 Sweet corn does not store well and needs to be eaten fresh mainly because the maturing process, which involves converting sugars to starch, toughens the kernels. Bottom line, do not let it linger and use it up as soon as you can, preferably the same day. How to choose an ear of sweet corn without pulling back the husks and unnerving the vendor? Gently feel the kernels through the husks and look for fullness. Plump is what you want! without pulling back the husk! Oh, as for those silk strands sticking out at the tip, brown and sticky is what to aim for. If you are still uncertain, just ask the vendor and he/she will guide you. Now, maybe I am telling you the obvious, but buying in season, from a local farmer’s market is the way to go. Knowing that your produce is grown locally and has not traveled so far, almost always guarantees freshness. HOW TO EAT SWEET CORN? Sweet corn can be eaten in so many wonderful ways. It can be eaten on the cob boiled (classic), grilled or roasted. Corn kernels can be tossed into stews, soups, salads and casseroles. If you love chowder, then why not try this Corn Potato Chowder, it doesn’t disappoint! And yes, fresh sweet corn kernels can be consumed raw. They do not need to be cooked for flavor and digestibility although cooking them just a tad could slightly boost and intensify the flavor. But why bother with blanching or boiling when sweet corn can be eaten just like that? When fresh, it is heavenly sweet and easy to chew. Are you ready to start prepping? First we begin by preparing the corn. This entails removing the husks (green outer leaves) and silks (long golden silky strands that lay between the corn and) the husks. To remove the kernels from the cob, just hold the ear firmly (wider end on the board) and cut straight down the cob with a sharp knife, cutting two to three rows at a time. Place the kernels into a medium bowl. Next, we need to toast the pine nuts. Heat a small skillet over medium-high, add the pine nuts and toast until lightly golden and fragrant. Keep a close watch and stir occasionally as they can burn easily. Transfer nuts to a small bowl and allow them to cool down. For the remainder of ingredients: Dice up the red pepper, remove seeds and ribs from jalapeno and mince finely. 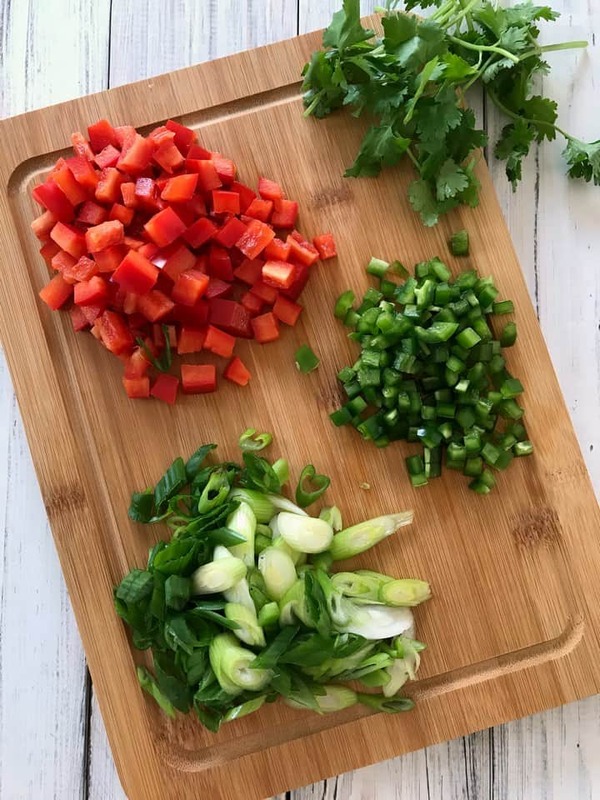 Thinly slice scallions on the diagonal and add to bowl along with corn, red and jalapeno peppers. Next, roughly chop the coriander and add to bowl along with lime zest. Lastly, add the feta, season with salt and freshly ground pepper. Drizzle with olive oil and lime juice, toss to combine. Taste and adjust to your preference. Simple as that! 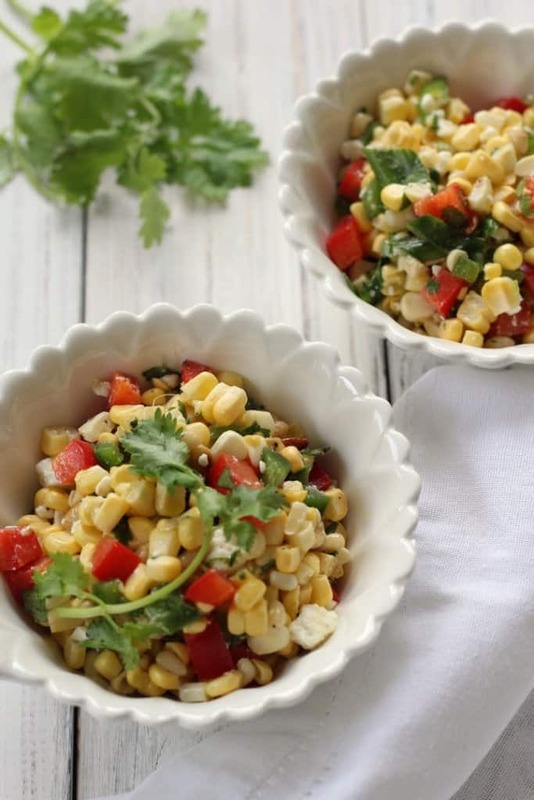 This Mexican inspired raw corn salad is delicious on its own but also a great accompaniment for grilled meat, fish or poultry. Toss in some black beans and avocado; add a heaping scoop to your green salad for a light and easy meal. My love for sweet corn began in elementary school when the new school year would be celebrated with a corn roast. The farmers arrived early in the morning with a truckload of corn and a large stock pot to be filled with water. It was most intriguing to watch the farmers dunk the sweet corn into the boiling water and to pull them out only a few moments later to be slathered in butter and sprinkled with salt. The corn was always perfectly sweet, crisp and tender! An event I always looked forward to! That’s when I realized corn at home was boiled too long, completely soft and tasting starchy. It is my first memory of that sweet, sweet corn taste that has inspired me to make this. It took some effort over the years to convince my mother that corn does not need to be cooked too long and now I need to convince her that it can be eaten raw. 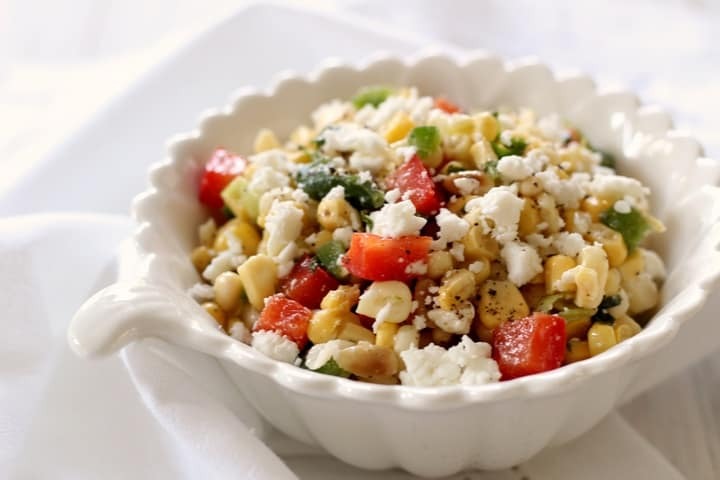 This cold corn salad recipe has been adapted from Joshua McFadden’s Six Season Cookbook; a wonderful book that celebrates vegetables and seasonal cooking. The original recipe included ingredients such as sweet corn, walnuts, mint and pecorino Romano cheese. My version has been modified to include toasted pine nuts, cilantro and feta cheese. As we all know, recipes are here to guide and inspire us and not necessarily to follow to the letter. Please your palate and adjust to your liking; nothing needs to be so precise especially when making a fresh corn salad. Maybe next time I will use cotija cheese instead of feta or basil instead of cilantro? The options are endless! Hope you will enjoy this Sweet Corn Salad as much as I did and thanks for dropping by! ★★★★★ If you have made this sweet corn recipe, I would love to hear about it in the comments below and be sure to rate the recipe! 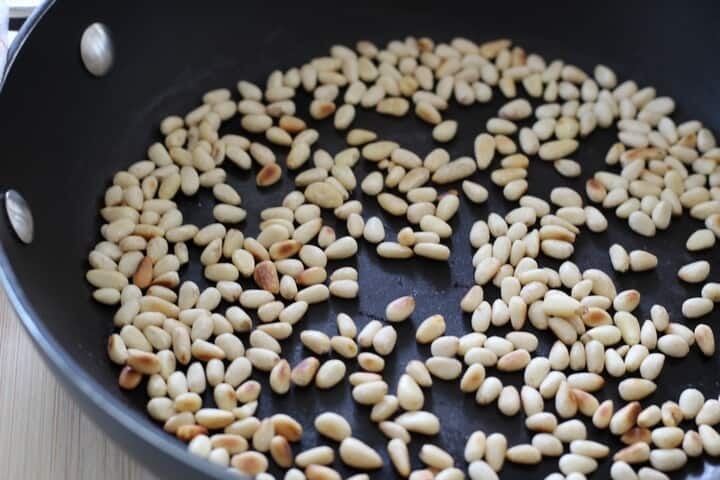 In a small skillet over medium high heat, toast pine nuts lightly. Keep a close watch and shake skillet or stir occasionally to avoid burning. When nicely golden, remove from heat and transfer to a small bowl to cool. 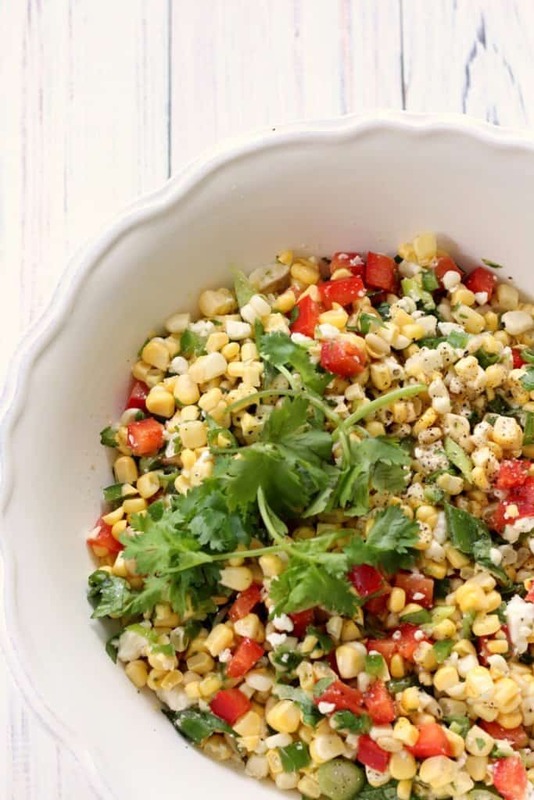 In a medium bowl, add sweet corn kernels, pine nuts, red pepper, jalapeno pepper, scallions, cilantro, feta, zest of lime and toss to combine. Drizzle mixture with lime juice and olive oil. Season with kosher salt and black. Give one final toss and adjust olive oil, lime juice, salt and pepper to taste. IF YOU ENJOYED THIS SWEET CORN SALAD POST, SAVE IT FOR LATER. PIN IT TO YOUR SALAD BOARD! Hi! I’m Sonia, a professional dietitian and cookbook addict with a passion for food in every sense of the way. As a busy working mom, I’m simply trying to get through life one meal at a time! My goals? To inspire you to eat healthy with pleasure and to bring homemade and home cooked back to the table. This salad is summer at it’s best! I make a similar dish, however it is sautéed – but using sweet corn why ruin perfection! This looks like such a refreshing sweet corn salad, can’t wait to try it! I am always looking for recipes with cilantro. Thanks for sharing! Fantastic! I’m so thrilled to hear you will trying the recipe. Enjoy. Thanks so much for stopping by. Delish! Would be great with chips!